Based on a children’s novel by Marla Frazee, 2017’s The Boss Baby introduces us to the Templeton family: father Ted (voiced by Jimmy Kimmel), mother Janice (Lisa Kudrow) and son Tim (Miles Bakshi). They’re a close clan and Tim loves his “only child” life. Tim’s world gets turned upside-down when a new Templeton enters the equation: an infant who wears a business suit (Alec Baldwin). The “Boss Baby” shows unusual talents and aspirations, qualities that pit him against his brother. The two eventually join forces to deal with outside threats. Despite – or perhaps because of – the silliness of the film’s “adult-acting infant” premise, Boss Baby comes with comedic promise. It may not boast tons of room for real wit or cleverness, but it should be able to maintain entertainment across its 97 minutes. This seems especially true due to the talent involved, as Baby offers a good cast. In addition to those actors, the film comes from Tom McGrath, the director behind hits like Megamind and the Madagascar movies. Alas, even with all those potential positives, Baby turns into a dud, largely because it seems like a mess. 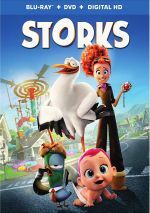 The film offers an odd mix of cheap kiddie humor with adult-oriented gags that come out of nowhere - and I don't just mean references like "cookies are for closers". The movie includes some jokes that feel semi-risqué for a story like this. Baby also suffers from a radical lack of internal consistency. It ends with an "explanation" that seems to excuse all these leaps, but it feels like "Bobby Ewing in the shower" to me. The finale just seems like a weak attempt to let the filmmakers have their cake and eat it, too. The problem with Baby is that its internal universe makes little sense, and the "rules" change from minute to minute. The movie adopts whatever logic it wants for the sake of gags and doesn't adhere to its own sense of reality. I don’t buy it, as the explanations feel cheap and like a "easy outs". The movie wants us to buy into the story as told but throws out its "excuse" at the end, and it doesn't work. I also feel bothered by the movie's tacit endorsement of puppy mills. That's all "PuppyCo" appears to be - while the movie may offer a fantasy "kid's-eye" version of it, I still get the feeling it's A-OK with the notion that dogs are churned out in a factory. A few laughs emerge here or there, but the film plods and goes nowhere. Boss Baby never becomes funny or clever enough to make up for its multiple flaws. Footnote: a tag scene shows up at the conclusion of the end credits. The Boss Baby appears in an aspect ratio of approximately 2.35:1 on this Blu-ray Disc. The movie came with an excellent visual presentation. Sharpness seemed terrific, as the film offered consistent clarity. This meant a tight image without a sliver of softness. No signs of jagged edges or shimmering occurred, and edge haloes remained absent. Of course, the image lacked any print flaws, as it remained clean at all times. Colors became a strong element. The movie skewed toward orange and teal, but it boasted a mix of other tones as well, and these displayed consistently vivid hues. Blacks were dense and tight, and shadows were fine, with nice clarity in low-light shots. Across the board, the image satisfied. When we move to extras, we start with BabyCorp and You. This three-minute, three-second reel offers an “orientation film” for the company’s employees. It’s cute enough but not great. In the same vein, ”The Forever Puppy” Infomercial lasts two minutes, nine seconds and it shows a fake promo for the movie’s important product. Like “BabyCorp”, it offers minor amusement. Another short piece, Babies Vs. Puppies fills three minutes, 26 seconds, as it presents a “news report” about the conflict between infants and pooches. It features some movie crew to provide another gently entertaining piece. A new short, The Boss Baby and Tim’s Treasure Hunt Through Time takes up three minutes, 35 seconds. 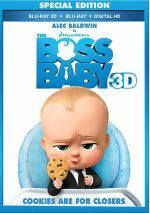 In this, Tim and Boss Baby go on a pirate adventure – one that largely seems to recycle footage from the movie. Though it gives us passable piece, it feels cheap. The Boss Baby’s Undercover Team goes for two minutes, 17 seconds and offers a cutesy look at the film’s infant supporting characters. Like the other clips, it comes with minor entertainment, but don’t expect much – and like “Hunt”, it seems chintzy, mainly because I’m pretty sure Alec Baldwin doesn’t do the voice of Boss Baby here. Next comes the three-minute, 37-second Cookies Are For Closers. It includes comments from director Tom McGrath, head of character animation Carlos Fernandez Puertolas, producer Ramsey Naito, and actor Alec Baldwin. The piece offers a look at the makeup/design of BabyCorp. It produces a couple of decent insights but lacks substance. The Great Sibling Competition fills three minutes, 27 seconds and features McGrath, Baldwin, and actors Steve Buscemi, Lisa Kudrow, and Jimmy Kimmel. Those involved discuss their reactions to their siblings. It’s another cute but lackluster reel. Four Deleted Scenes last a total of 11 minutes, 30 seconds. These include “Tim’s Nightmare”, “Puppy Interrogation”, “Car Ride” and “Emergency Landing”. All offer minor amusement but none seem especially memorable. That 11:30 running time includes introductions from McGrath and Naito. They give us basics about the scenes as well as why the clips didn’t make the final cut. A Gallery gives us 36 screens of concept art. It’s a pretty good collection. The disc opens with ads for Captain Underpants, Diary of a Wimpy Kid: The Long Haul, Spirit: Riding Free, and Voltron: Legendary Defender. Sneak Peeks adds promos for Despicable Me 3 and All I Want For Christmas Is You, and we also get the trailer for Baby Boss. 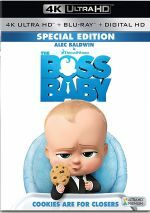 A second disc provides a DVD copy of Boss Baby. It includes the same extras as the Blu-ray. 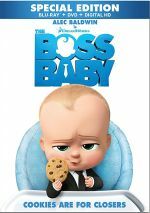 Aspects of The Boss Baby veer toward cleverness, but the movie shoots itself in the foot. It cares more about its erratic attempts at comedy than any form of consistency and development. The Blu-ray provides stellar visuals along with very good audio and superficial collection of supplements. Boss Baby disappoints.